If you’re lucky enough to have large windows in your home, you’ll know that they create a bright, airy and luxurious feel to any room. Natural light compliments any interior style or décor, and helps you to feel invigorated and energised. But large windows also have their drawbacks. They can let the cold in during the winter months, and without the right blinds for large windows, they can compromise your privacy. We’ve selected the best blinds for large windows, from our range of handcrafted blinds, to help you make the right choice for your home. 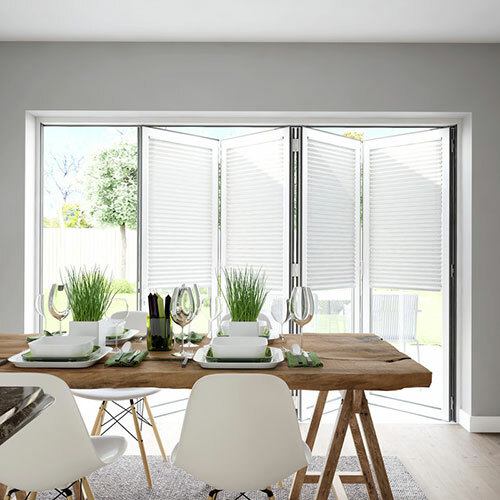 Bi-fold doors work best with pleated blinds, which don’t get in the way when opening and closing the doors. Pleated blinds allow you to vary the effects between each panel, meaning you can enjoy privacy in one part of the room while allowing the light in to the rest. If your concertina doors let the cold in during the winter months, then energy-saving Duette blinds might just be the solution. Their smart hexagonal shape helps to regulate your indoor temperature and reduce your heating bills. There are a variety of options for French doors, and your choice will depend on what room of the house your French doors are in. Bedroom blinds need to effectively block light so that you can sleep, meaning fabrics are your best option. French doors in the dining room or kitchen should be easy to clean and durable. Read about our blinds for French doors to help you figure out which blinds are best for yours. Floor-to-ceiling windows make a bold statement, and your blinds need to complement this. For example opt for a modern and minimal look with Pirouette blinds. These offer maximum privacy when in use, and fold away discreetly when not in use so you can make the most of your view. Sash and casement windows often feature multiple windows in a row, meaning you’ll need individual blinds for each panel. Why not make a statement with pleated blinds in bright colours? Or insulate your home against the elements with Duette blinds. The advantage of choosing individual blinds for each panel means you can adjust each one to suit the atmosphere of the room from morning to night. Bay windows can be difficult to dress and install due to their unique configurations. Bay windows also tend to face out onto the street, meaning privacy should be a priority when choosing your blinds. Our Duette blinds and Silhouette blinds both offer style as well as privacy in soft fabrics. When your entire room is made of glass, your blinds can make or break the overall feel of a conservatory. How you choose to dress your conservatory windows depends on your personal style as well as practical considerations. Does your conservatory get a lot of sun? If so, blinds will help preserve your furnishings and prevent UV damage, as well as keeping the temperature cool. 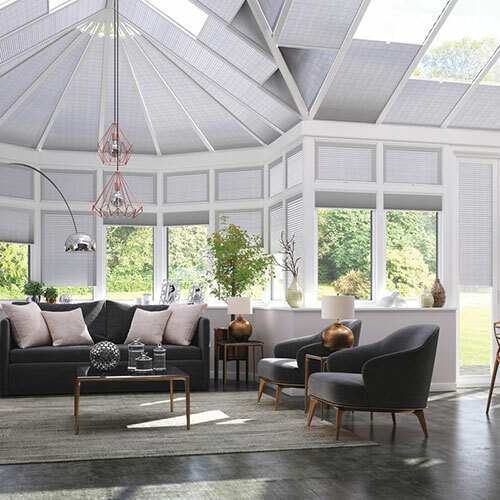 Browse our range of conservatory blinds to find the right ones for your home.